Speed Up is an Interactive Learning Methodology made for digital platforms and printed books. Providing quality education and learning experiences that respond to the needs of new generations of students and teachers. Speed Up is one of many English Learning Methodologies from AMCO. It provides an innovative digital content delivery system for meaningful learning. Its content and use of multimedia and technology encourage the creation of a “Total Learning Environment” where the student and digital mediator connect. I started this project as a visual designer creating layouts and interactive graphics. I later took the role of Project Designer and was in charge of guiding the design process and creative strategy of the project. Speed Up "innovates by offering a comprehensive educational solution that uses technology to facilitate the teaching-learning process and motivate students." 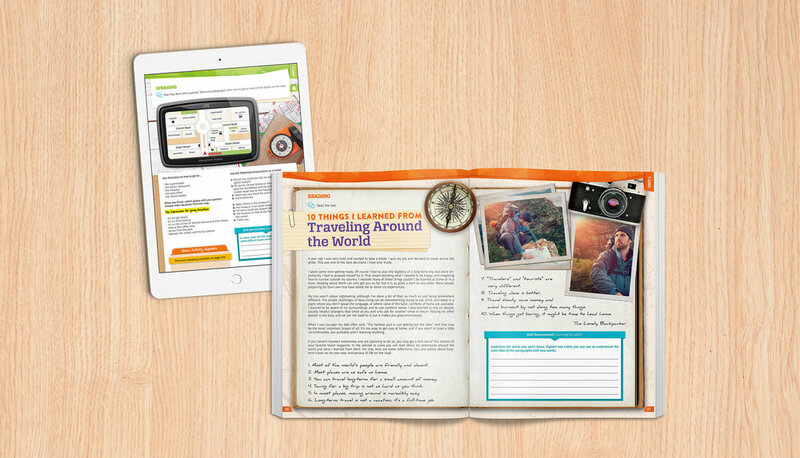 Students and teachers can study and work with Speed Up through the printed books, the iPad app, or through the web platform. The print version of Speed Up was the first completed product. The process started by creating a prototype of 'Unit 1' to structure the content, sections, and materials that it would include. I designed icons and activity boxes to separate and highlight important information or sections that students were required to read and solve. These icons and boxes stand for bonus activities, grammar tips, and self-assessment questions, they are displayed throughout the content of the book. The book is separated by units, each unit has its unique theme. The covers for the units visually represent the theme through a photograph and a title that is individually designed to follow the creative concept of the cover. Lastly, it shows the main topics that will be addressed in the unit. The challenge for the Speed Up eBooks was creating a digital guide that followed the same visual language but its content was interactive. They were designed to be opened in a web platform or in an iPad, where hey can be viewed and downloaded through the Amco app. Each page of the eBook has buttons that allow an easy navigation for students and teachers. These buttons can take them to the menu page at any moment, review the answers to the page and play audio tracks. The interactive Speed Up method has a General Menu that allows the teacher and student to easily navigate through the content of the book. At the beginning of the experience students and teachers are prompt on what each icon displayed throughout the book represents, making it easier for them to comprehend the diverse number of activities. The first step in designing Speed Up was bringing the content from editors and copywriters to life. With the use of visual guidelines, we created an editorial style guide that allowed us to have a flexible structure to follow, but at the same time the ability to modify it with subtle changes. 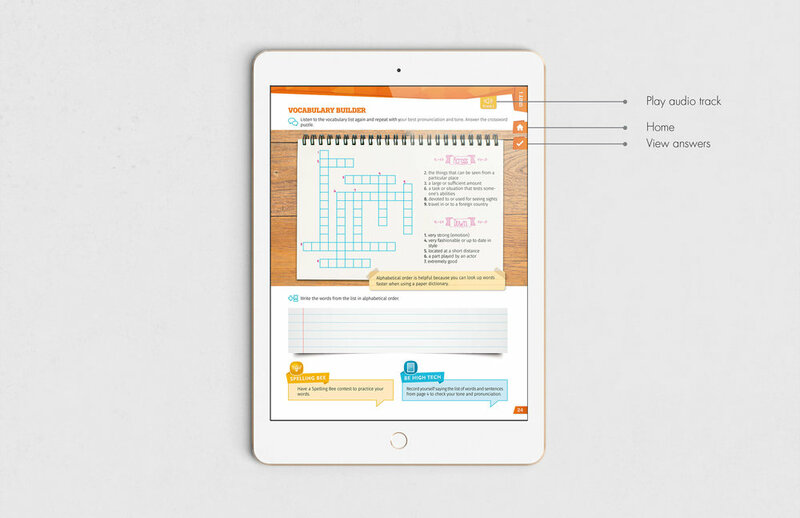 This created a dynamic and engaging product for students and users. Vibe is a digital magazine through which students have access to entertaining and educational content, including trivia, crosswords, biographies of famous people and fun activities. The visuals and graphics were created to have an edgy and youthful look. The design and content are meant to engage and appeal to middle school students and inspired them to learn. These magazines are part of the recreational and engaging materials that come with every grade of the English Learning Method, Speed Up.